My obsession for makeup is growing day by day, as you may have noticed by my overload of beauty posts lately. After having tested Zoeva’s beautiful makeup brushes last week, I’m now up for reviewing their new eyeshadows which will be available February 23 at Zoeva. The Zoeva Rose Golden eyeshadow palette consists of 10 beautiful glittery, metallic and matte shades in a versatile range from warm, dark colours to stunning softer tones. Almost all the shades can be worn individually or layered. 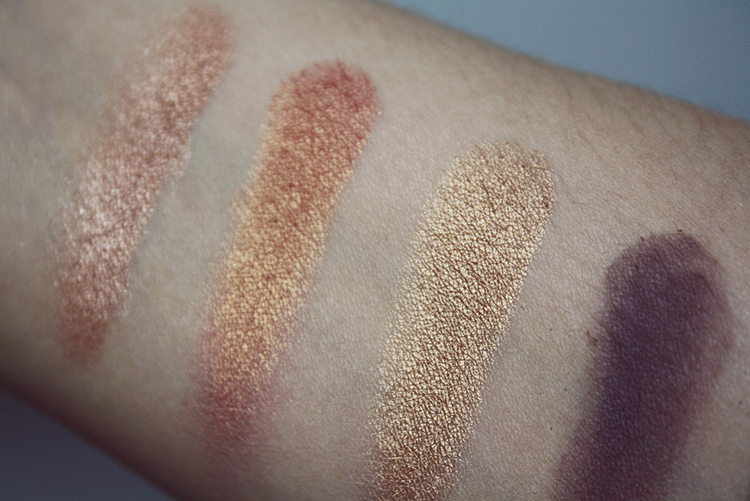 ‘Copper is King’ is just one of the cute names that Zoeva gave their eyeshadows. So let’s quickly go to the swatches! 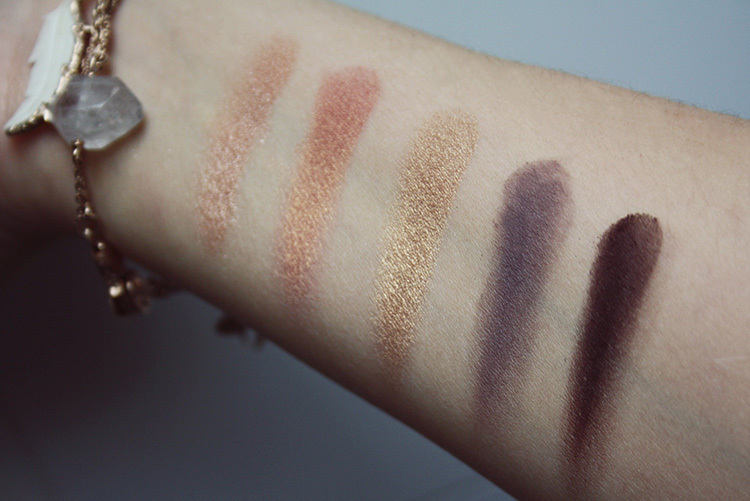 These swatches on my arm on the pictures below, are in exactly the same order as the eyeshadows in the palette. As you can see, all the shades are intensely pigmented. Even the matte finishes give a high color pay off and great coverage. When you apply the golden shimmery shades it gives almost the same effect as gold flakes, it’s just so unique and gorgeous! All the shadows have a soft, smooth texture that makes them blend easily and beautifully. I’ve created a full eyeshadow look with this palette – which will be on the blog soon – and worn it for a good 6 hours without creasing. But a minor detail that I should point out is that I have used a eyeshadow primer underneath it. I actually always do this because it further enhances the longevity of eyeshadows and prevents creasing. I like the variation of golden colors and finishes you can get from just using this single palette. 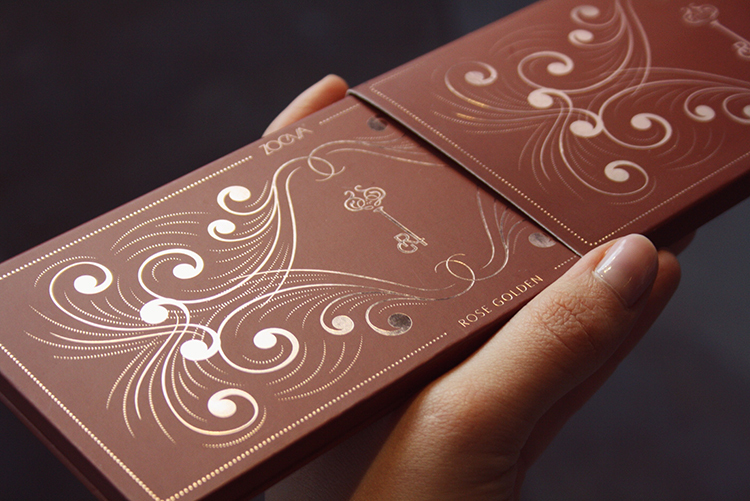 The palette is cut from lightweight paper board, which is convenient when you take it with you. 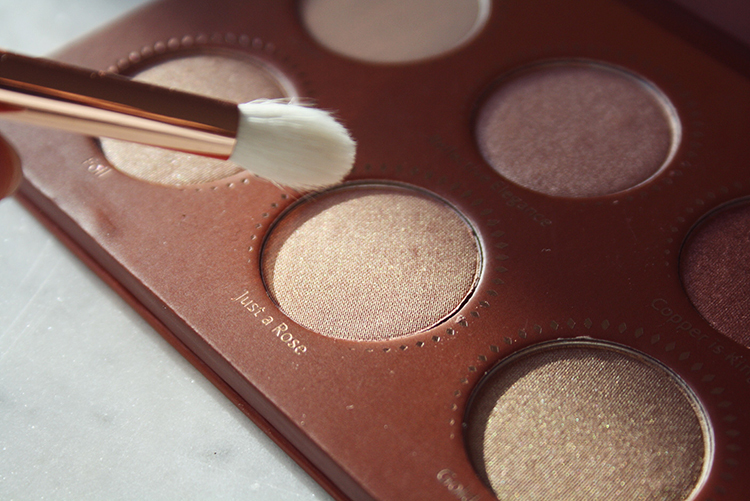 It would be easier to take with you on the go, if the palette would have an integrated mirror. So that’s about the only downside I can think of. I wouldn’t want to use this palette for every day wear, but it is definitely a brilliant quality palette to spice up your looks and add a festive sparkle. And it’s amazingly affordable, only €17.50 for ten beautiful shades! Posted in BeautyTagged eyeshadow primer, review, Rose golden eyeshadow palette, zoeva cosmeticsBookmark the permalink. I just love the coppery rose look of them!